Two magical winged horses actually called Hippocampuses frame a beautiful Swarovski Siam crystal. Hippocampuses are actually mythical sea creatures which were part horse and part fish, much like a seahorse. They rest upon layers of antiqued gold brass filigree and have been embellished with tiny gold metal roses and Siam Crystal Dust. 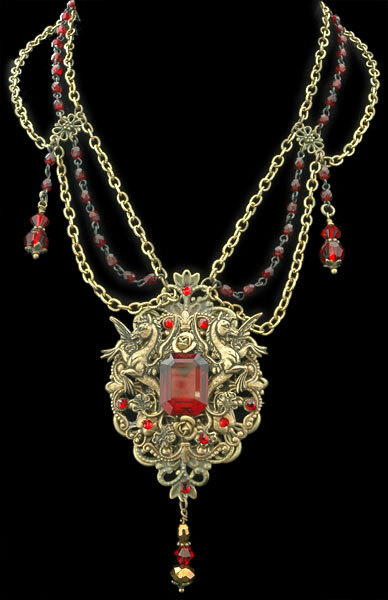 The handmade brass chain is delicately etched alongside a lovely deep red rosary chain while tiny Swarovski crystal drops add to the beauty of this magnificent piece.